Trial By Sapphire's first giveaway! I am so thankful for my readers, and I love the blogging community. TBS has over 105 readers according to Feedburner! Thank you so much for your support over the last 6.5 weeks. It has been so fun to dive in head-first and learn so much from all of you. 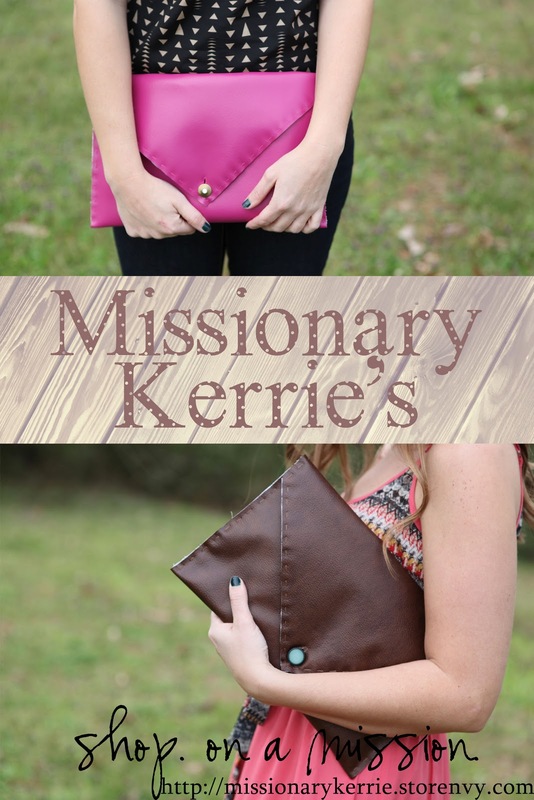 an envelope clutch of your choice from Missionary Kerrie's! ** Please leave a comment for each entry including your e-mail address (so I can contact you if you win). Tell me one way you help to save the environment. "I entered @SapphireLindsay's giveaway! Have you? http://bit.ly/y1bO3H"
The giveaway ends Thursday, March 22, at 11:59pm. The winner will be chosen via Random.org next Friday, March 23. ** I was not compensated for this post. This is a product that I chose and paid for independently. SOOO FUN! Love her stuff! oh and I save the environment by recycling in my classroom although NO OTHER TEACHER IN THE DISTRICT does! I tweeted about the giveaway!!! Yay! You so deserve it, Linds! I WANT ONE OF THESE CUTE CLUTCHES! I already get emails by subscription and have liked you on FB. However, Twitter is not in my future, so I guess I'm out on that account. and follow you on GFC! I'm not going to be original as well - recycling.. Probably it's not enough, I know.. I can help save the environment by using less water while doing dishes, and turning off lights when I leave a room! And I've subscribed via Google Friend Connect! Great giveaway! I love Kerrie!! I save the environment by not littering! Gross! I also hardly use mass-market plastic water bottles. I always use the same bottle and drink good-old tap water! IIII foollowww you on bloglovin too! I carpool when I can! I save the environment by carpooling whenever I can! i help the environment by using reusable water bottles! Super cute clutch! I'm a kindergarten teacher and I keep a recycling box in my classroom for all of the kid's construction paper or extra paper from projects! aaaand I like you on Facebook! aaaaand I follow you on Twitter! aaaaand I just tweeted about your giveaway! I try to save the environment by taking our bottles and cans to a local recycling center. We try keep up with this once a month. I always use reusable shopping bags at the store. I am now following your blog on "Bloglovin"
I "liked" your blog on facebook. I follow you on twitter, Facebook and GFC!! To save the environment I recycle, donate clothes when I am done with them and unplug everything I am not using-always! Following you via GFC and RSS! I help save the environment in many, many ways at home and at work -- recycling materials, use organic cleaners, pesticide-free maintenance in the garden, use cosmetics that are not tested on animals and contain natural ingredients. My most favorite way to help the environment is to go outdoors and join a clean-up campaign! This is so cool! I tweeted about it! Followed you already on GFC. You know I follow you via GFC!